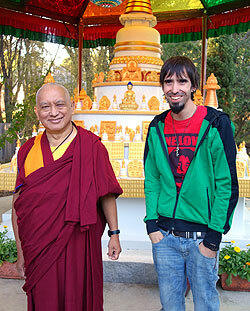 Lama Zopa Rinpoche at Land of Medicine Buddha, Soquel, USA, September 2013. Merit Box Collection Coming Up Soon! New High-Res Photos of Lama and Rinpoche! Lama Zopa Rinpoche wishing us all “Big Love!” Aptos, California, USA, September 2013. NEW! Enjoy daily news about Lama Zopa Rinpoche on fpmt.org! Lama Zopa Rinpoche and Tenzin Ösel Hita, Aptos, USA, September 2013. During the long life puja offered to Rinpoche by the board of FPMT Inc. and FPMT North America at Land of Medicine Buddha, USA on September 29, 2013, Tenzin Ösel Hita read words of praise to Lama Zopa Rinpoche. The official annual long life puja offered to our most kind and immeasurably precious spiritual director Lama Zopa Rinpoche, source of our inspiration and guidance, on behalf of FPMT centers, projects, services and students will be offered at Kopan Monastery on December 9, following the one-month November course. If you would like your name or center’s name to be included in the list of donors, please make your offering by December 5. 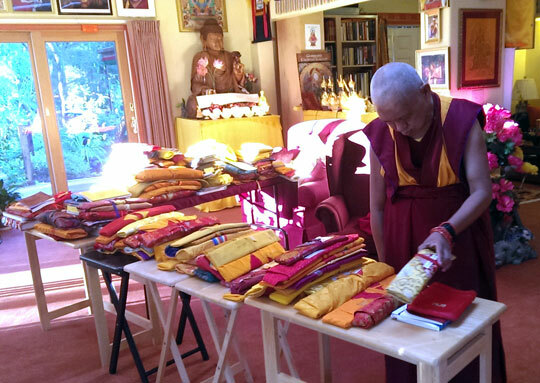 Lama Zopa Rinpoche sorting through his texts, all of which are carried in four big heavy suitcases everywhere Rinpoche goes! Aptos, USA, September 2013. Last month’s e-news shared Lama Zopa Rinpoche’s recent advice wishing that students would actualize realizations. Rinpoche is encouraging students to follow a lam-rim outline and meditate on each subject for two weeks or one month for a year until all subjects have been studied. To help students fulfill this request, FPMT Education Services has put together a list of lam-rim resources. This puja, by Ngawang Paldan, translated by Martin Willson, is an extensive puja including elaborate offerings, praises to Shakyamuni Buddha, and homage to Shakyamuni Buddha’s previous lives and detailed biography. This edition of the Lama Chöpa without the Jorchö practices contains the essential additional prayers recommended by Lama Zopa Rinpoche. 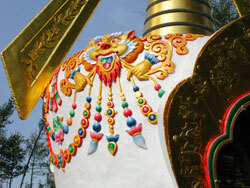 Adornments on the 14-foot [7-meter] Auspicious Stupa of Many Doors at Milarepa Center, Vermont, USA. Photo courtesy of Milarepa Center. The Stupa Fund is very pleased to present you with a new page on fpmt.org dedicated to showcasing and keeping count of this incredible effort happening around the world to fulfill Rinpoche’s wish. Start counting up your Merit Box donations! Or if you haven’t started yet this year, consider becoming a Merit Box Practitioner! On Lama Tsongkhapa Day, December 27, we will begin collecting contributions for the International Merit Box Project. 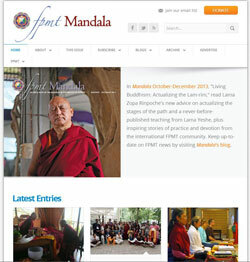 Our daily blog features fresh news and updates from FPMT centers, projects and services in 36 countries worldwide as well as stories from the latest issue of Mandala and our rich archive of 30 years of FPMT coverage. Or if you would rather get our latest blog posts delivered by email, subscribe to our RSS feed. The redesigned 2014 Liberation Prison Project calendar features a CD-style jewel case that converts from carrying case into to display stand suitable for desk or altar. This year’s calendar also makes use of unbound pages, so there’s no cutting required to make use of the holy images on the back of each page! FPMT centers, projects, services and study groups are eligible for a wholesale discount. A compilation of key organizational advice given between October 2012 and September 2013. This and the previous year’s compilation are available in the FPMT Affiliates Area/Further Resources/Key Advice Compilations. We are putting together a photo story of all centers, projects and services that have hung the Tendil Nyersel prayer flags as requested in April as one of the practices for Rinpoche’s health and long life. If you would like the prayer flags at your center, project, service or study group to be included in Mandala, please send one to three high-quality and high-resolution photos of your prayer flags with full caption information, including the photographer’s name. We would also love to hear a little about how the prayer flag hanging happened, particularly any juicy stories, with good quotes from the people involved. If you haven’t already, you can order the prayer flags from Kopan Monastery or from the FPMT Foundation Store. Lama Yeshe gave wonderful advice in 1983 on the importance of retreat centers and the importance of doing retreat. Lama also gave crucial advice for those working for a retreat center. 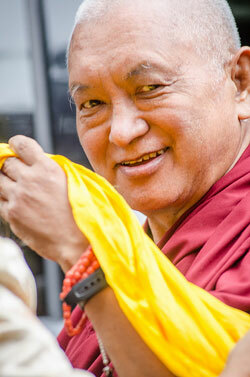 Read the full advice on Lama Yeshe Wisdom Archive. The advice is also in the retreat section in the FPMT Affiliates Area. Lama Zopa Rinpoche and Lama Yeshe, Lake Arrowhead, 1975. This photo is from a three-week retreat the lamas taught at Camp Arrowpines on Lake Arrowhead, east of Los Angeles, USA, 1975. Enjoy wonderful photos of Lama Yeshe and Lama Zopa Rinpoche together, courtesy of the Lama Yeshe Wisdom Archive (LYWA)! These prints are available to download from the FPMT Affiliates Area – or you can order high-quality prints from LYWA. Chenrezig Institute, Australia is seeking a director; Tong-nyi Nying-je Ling, Denmark is seeking an FPMT registered teacher as their new resident teacher. New mailing address: PO Box 16, Glenside, SA 5065, Australia.